I have a love / hate relationship with coffee franchise chains. I appreciate that they have helped to make coffee culture much more popular than it was previously, and it is now possible to get an espresso of known quality and consistency in most parts of the world. Some chains are certainly better than others, however there are still some examples where stale, over roasted beans are the norm, and where quantity takes precendence over quality. The skill set of the barista - the experience of tamping and pulling shots, of learning to assess the correct grind size for beans - is sadly reduced to the ability to press a button. Even worse, customers come out of franchise chains thinking that espresso shots are supposed to taste bitter, almost acrid. 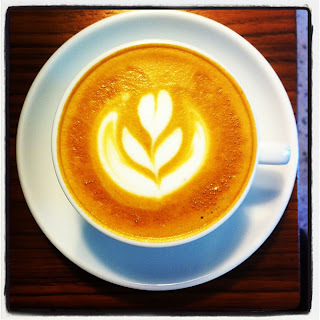 Fortunately, there is a large (and increasing) number of independent cafes and roasteries where the opposite applies, and which serve as test beds for new and innovative blends and brewing methods.The entire point of this blog is to highlight cafes where the owners committment to good coffee is evident. Nylon is one such example, where some superb single origin, third wave coffees can be found in a quiet residental corner of Outram Park. 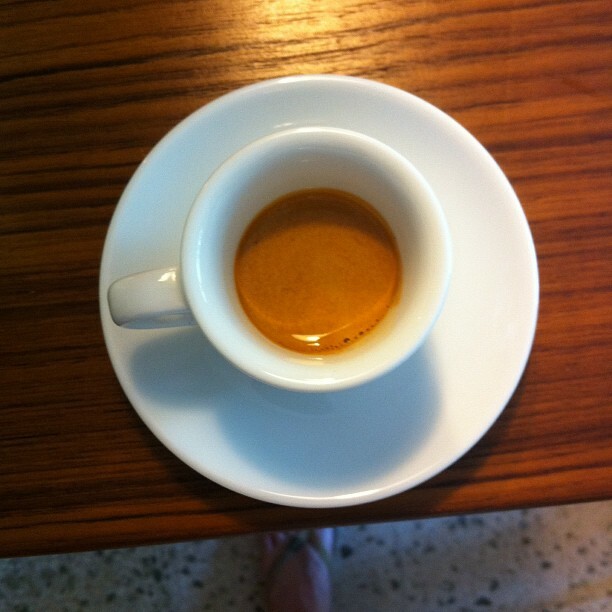 Nylon's house blend - El Primero - is a mixture of 60% Brazilian and 40% Nicaraguan beans. This results in an espresso with a medium dark crema, and a distinct flavour with citrus elements. I'm struck by the initial taste of the shot - it's not bitterness, it's a combination of a medium bodied espresso with distinct citrus flavours, and it's certainly something that I have not seen in most cafes. El Primero (along with Papa Palheta's PNG Peberry) is unique. Both are products of long hours spent working out pairings of beans to blend together, of coming up with roasting profiles for each blend, and experimenting with different ratios of beans. The time and effort that has gone into crafting each blend is obvious - this is the antithesis of every over roasted, over extracted coffee where any flavour or uniqueness was drowned in a sea of milk, whipped cream and caramel! Nylon's 5oz coffee (below) is smooth with a nice subtle flavour, the latte art was beautiful. Aeropress and pour over coffees are also available, as well as occasional cold brews. I noticed that a digital scale was used for measurements, just as it was in Highlander. This is always a good indicator of quality coffee, as it suggests that the baristas have put thought and effort into the process. It also implies that a specific ratio of beans to water has been tailored to the house blend. There is an interesting approach to the menu also. Rather than having conventional lattes and cappuccinos, there are 3oz, 5oz and 7oz sizes available. This is a clever idea - while some franchise chains serve what are essentially bowls of caffeinated warm milk, the owners of Nylon have ensured that a broad variety of preferences are catered for, while never losing the underlying coffee taste - coffee is always the most fundamental component of each drink. Furthermore, as milk is steamed, lactose becomes more soluble (coffeegeek.com has more information on this process), which imparts sweetness to the drink. Coffee which has been prepared correctly should not need sugar - this is one of the many things that are not merely done correctly at Nylon, but are done very, very well. Once again, Dennis and Jia Min's passion for coffee is evident throughout. Sugar is typically not served at Nylon (although it is available if requested). This ensures that the underlying flavour of each coffee blend is not lost, and also has the welcome effect of exposing customers to the different flavours, acidity and balance of beans from different regions. This is something that I love to see happening - customers are subtly being educated with each cup! It also makes customers think about what they are drinking, which should only be encouraged. A selection of coffee beans and accessories are available to purchase also - but rather than the usual selection of accessories that are available, Nylon have focused on more unique, hand made items. Kalita wave drippers sit alongside custom Japanese hand grinders, and a quirky wooden coffee scoop which doubles as a bag seal. It's a nice touch - an independent cafe that supports other independent businesses. Since opening a few months ago, Nylon has become one of my favourite coffee places, with consistently good coffee, and owners committed to making the best shots possible. This is definitely worth trying - don't waste good money on bad coffee at a franchise, when some superb shots are being pulled at Nylon!